Topiary Landberg, PhD Candidate in Film + Digital Media and a THI Graduate Student Researcher, is an experimental media artist and film scholar whose doctoral research focuses on urban landscape documentary media. Her scholarship and creative work highlights collaborative forms of political and environmental activism that shape and transform the city. Integrating her experience as a filmmaker, multimedia installation artist, writer, teacher and curator/programmer, Landberg brings an interdisciplinary approach to film studies and urban ecology. Part of Landberg’s dissertation is an interdisciplinary documentary titled “Exit Zero: An Atlas of One City Block.” That work invites audiences to navigate through the history of a single central city block in San Francisco and provides insight into anti-freeway community activism and a long view of gentrification. (Exit Zero will launch publicly sometime in early 2019.) As an filmmaker and scholar, Landberg’s research interests align with the collaborative and community-engaged values of the Oakland Museum of California, where Landberg has been chosen to become the museum’s first Mellon Curatorial Fellow. This two year appointment provides Landberg the ideal opportunity to strengthen her curatorial skills while helping to bring untold California stories to new audiences. Working with The Humanities Institute as a Research Development Fellow introduced Landberg to a range of possible career opportunities for PhDs. While serving in this position, she helped other graduate students explore funding possibilities and communicate their research for broad audiences. This work also helped Landberg to hone skills that she applied to her own work and career goals. Landberg explains, “As a film PhD student who aspired to bridge the art, film and documentary world with a strong interest in history and geography, I sought a pathway into museum curation and exhibit design. Working at THI and in the Arts Research Development Office helped me understand the process of finding and applying for fellowship opportunities that speak to my passions.” As Landberg navigated her graduate work, she looked for ways to engage with public institutions where her media-making experience and academic research would be both valuable and accessible. In collaboration with the Director of Content Development and the curatorial staff at the Oakland Museum of California, Landberg is working on a number of different upcoming exhibits. 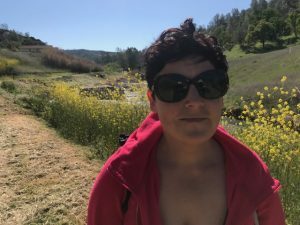 One of the most exciting projects she has been given is to research and develop a large, graphic timeline for the upcoming exhibit “Queer California,” opening in mid April 2019. Over the next two years, Landberg will also be cataloging some of the thousands of photographs in the Dorothea Lange archive and working with the curators to survey, research and catalogue OMCA’s art and history holdings more generally. Looking across the art collections to identify compelling Oakland-specific stories and issues that cut across media and time periods, Landberg will have the opportunity to develop her own curatorial projects. She is excited to bring her passion for urban landscape film to the museum and particularly hopes to program some public film screenings in the future.